I was very happy to get hold of my Note2 the other day! Sadly though, the version that has arrived to our shores is without LTE. For now LTE is only available here if you buy the first generation Note. I hope the LTE version for Note2 will arrive very soon as I understand that LTE will be available to UK customers on first release. Makes me wonder why we weren’t given the option here. Aside this disappointment the new Note2 is a nice piece of hardware. 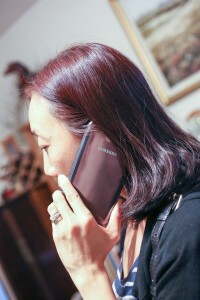 If you are already a Note user or a Samsung Android user for that matter, you would be able to get around the phone just fine. It feels like a more refined Note with nice tweaks and enhancements to the hardware and software. In terms of size it is slightly longer than the original Note, but has a thinner profile. I feel that the unit is a lot more comfortable to hold now because of the slimmer profile and feels smaller and compact overall despite it having a larger 5.5″ 16:9 screen and larger 3100mah battery. Battery life is better compared to the original Note. I normally carry a second battery for the first Note. So far the Note2 is getting me through the day and right through to the evening, so I wonder if there is a need to get an extra battery at this stage. This a good sign so early on in receiving the new phone. This is when I use the phone the most while tinkering with the new toy, so I should be really draining the battery more than any other time. I should mention though, that I have the power saving option and Juice Defender running on the phone already. I have not noticed the battery saving mode impacting perfomance at all. With Juice Defender and Power Saving options set on the original Note, I would sometimes still get home with battery levels at 30%. With the Note2 I would be getting a similar battery level more towards 12 midnight with similar usage. The phone standby has improved quite a bit as well. If the phone was left in this state I can see it lasting through 24 hours with juice to spare for the next day. 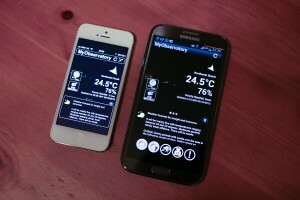 There seems to be quite a difference the way OS runs between the Note2 and Note. 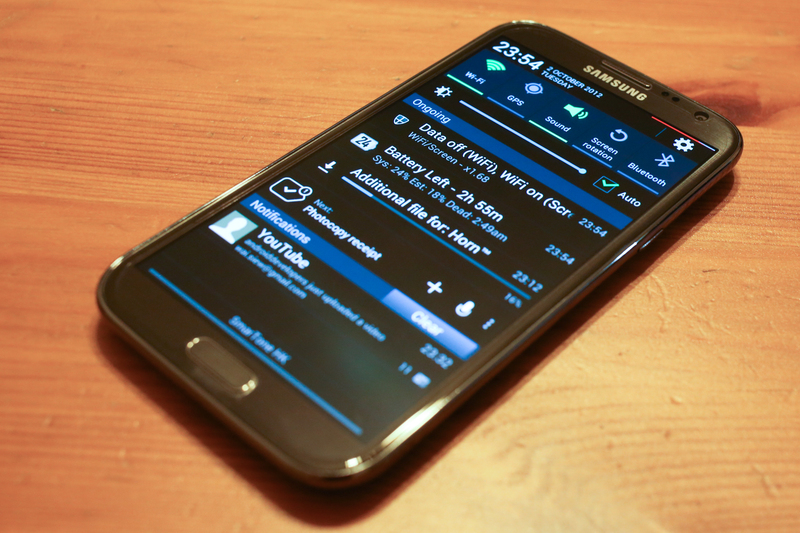 The Note2 performs so silky, smooth now. I suspect it is a combination of the Quad Core, the 2gb ram and overall improvement with the Jelly Bean Android OS. With the original Note I would usually get a few stalls and lags throughout the day. Also on some occasions the Note would run quite warm, especially around the area which houses the camera lens. More often than not it would occur while accessing the internet or checking email. So far I am happy to not come across such problems with the Note2. There are quite a few new features added to the new Note. Too many in fact to mention all in detail. There are a few improvements however, that I think are worthy of mentioning. 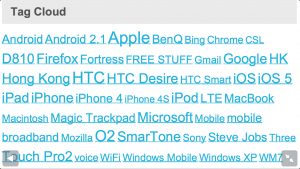 My number one favourite is the pop up browser. If you tap on a link you can choose to pop up a smaller windowed browser. I found this especially useful when searching for info with Google. While the browser is loading you are able to move the window anywhere on the screen and you are still able to browse and scroll in the original browser. You can also do a similar thing to video as well. When you choose a video you have an option to minimise the video. It will play in it’s own little window, while you have access to the rest of the phone functions. The video screen can be pinched and zoomed for screen size adjustment. With the Note you are spoilt for choice for screen capture. You can either hold down the button of the S-Pen and press it on the screen or you can even do it iPhone style by pressing the power button and menu button simultaneously. The Note2 has an added option of just swiping the screen horizontally with the side of your hand. This by far is the most convenient and fastest way of doing this. I find the proximity sensor quite useful as well. Generally to help save battery I set the screen to turn off after 15s of idle. If I happen to be reading something it may sometimes take longer than 15s so the phone will just turn off. The Note2 is now able to observe if you are still viewing the screen. On the task bar an eye will appear for a split second to indicate that the sensor is functioning. The screen will stay on so long as I am still viewing the screen. Also if the screen is off in standby mode I am able to put my hand over the screen. The phone will sense this and will show up a screen briefly that has the time and date, missed calls, unread text messages and battery life. The features I mentioned are relatively minor to what the other things that the phone is capable of, but they have made the Note2 a very pleasant and enjoyable phone to use. It has helped to achieve a level of refinement over the original Note. Perhaps the most controversial feature of the Note is it’s size. The Note’s size is probably one aspect of the phone which might possibly be the sole deciding factor as to whether one loves or hates the phone. As I mentioned earlier the new Note2 feels more compact to hold than the original Note, but in comparison it is still a fair sized phone. With the Note2 and the iPhone5 (i5) being released at around the same time I couldn’t help, but grab them to see them side by side. Perhaps I can justify this comparison as both these phones boast a 16:9 aspect screen. Other than that comparisons slowly diverge from there. 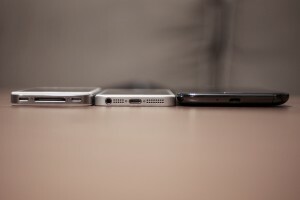 What you see above is the iPhone5 nestled in the middle of the iPhone4s and the Note2. 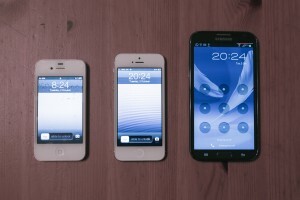 The i4s is just to get an idea of how the screen size has changed on the i5. 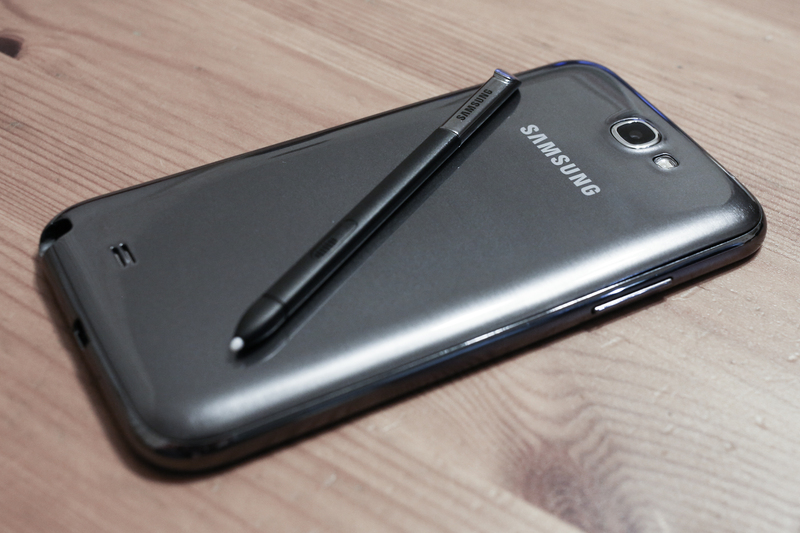 The Note2 is there to…well to show it’s glorious screen size of course. Apple did well to get their new phone so beautifully thin. As the two phones have the same screen aspect ratio one would expect the same information on both screens. The i5 has one drawback and that is the actual physical size of the screen is much smaller. For the text to be identical for the i5 screen the font size would have to be the same. This may well be possible, but it may cause the text to be too small to read comfortably. As you see here is the Hong Kong, MyObservatory app on both phones. 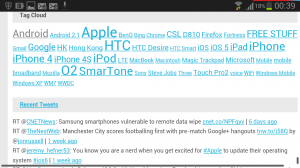 For the text to be comfortably read on the i5 the font size needs to be relatively larger. As a result the screen layout has a more compacted appearance. Another example above is in the horizontal view. 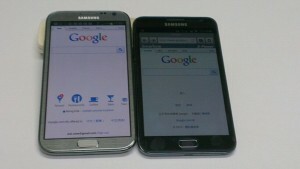 The Note2 being on the left image and the i5 on the right. If the font size were made to match that of the Note2 on the i5 the text would become exceedingly difficult to read. Finally we should make a comment about using the Note2 smartphone as a phone. Comments abound regarding how ridiculous it looks when putting the Note against your face. Perhaps it could be just a matter of adjusting and getting used to it. 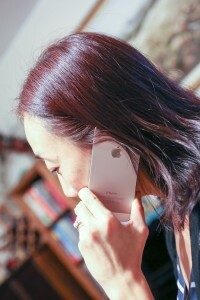 Compared to the keypad candy-bar phones the iPhone is pretty large, but people have grown accustomed by now to the size. I have had a Note since last year November and it is my day to day mobile phone. So many in Hong Kong are carrying this phone now. It seems pretty normal to see people using this phone now. I find no problems in making and taking calls with it and I am even happier when using it’s lovely big screen. I will leave you with the last pictures of my wife using both the Note2 an i5 and will let you make the call!